The highly anticipated sequel to 2012’s hit indie top-down insta-kill mayhem shooter Hotline Miami will be hitting PC, PS4, PS3 and PSVita on the 10th of March (unless you live in Australia, that is). 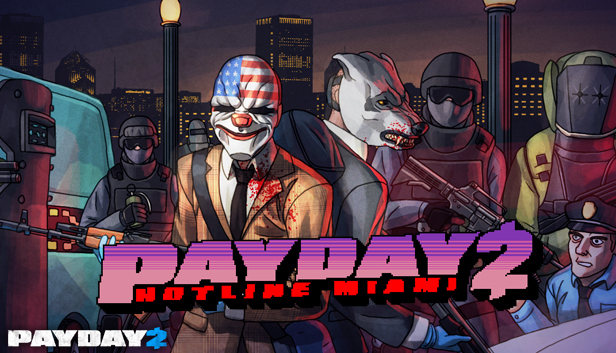 Devolver Digital came up with a cross-promotion between Hotline Miami 2: Wrong Number and Payday 2 and its current-gen counterpart Payday 2 : Crimewave Edition. Pre-ordering Wrong Number will net you several in game skins and usable items, most notably a pack of the former game’s iconic masks containing Richter the Rat, Jake the Snake, Alex the Swan, Tony the Tiger, Corey the Zebra, and Helmet. Pre-ordering this hyper-violent murder romp will slice 10% off the price. Hotline Miami 2: Wrong Number will go for $15 on GOG and Steam, and additional five bucks will get you the special edition, coming with the bonus of an extended soundtrack with 6 additional remixed tracks, and even more in-game stuff for Payday 2, such as additional Hotline-themed weapons, and a perk set (along with the knowledge that you supported the developers of Hotline Miami with more money!). Hotline Miami 2: Wrong number will jump around timeline-wise, containing a prologue to the first game ,as well as a continuation of the story. In Hotline Miami 2, we will take control of several varied characters, each in some way connected to the first game’s protagonist, named “Jacket” by the fan following of the series. We will deal out death (or sleep-aid, in the case of the Writer) as an actor playing Jacket, a group of vigilantes impersonating jacket, a detective investigating the murders committed by Jacket, and some others with tangential relation to Jacket, who are unannounced as of yet. The gameplay will be largely unchanged, but some additions, such as dual-wielding and bi-directional aiming have come into the picture. Visually, Hotline Miami 2 is inherits the psychedelic, pixellated 80’s vibe the first game had going on. Hotline Miami 2 wil be available on Steam and GOG on the 10th of March.